As Jim noted in his journal, 1979 was “A VERY MAJOR BIG YEAR”. The Muppet Show, starting its fourth season, was airing in over 100 countries, and the premiere of The Muppet Movie that summer was a huge success. Sesame Street was entering its second decade, a Muppet touring exhibit launched, and Jim moved his offices into a large double townhouse on Manhattan’s Upper East Side. What better way to celebrate than to participate in Macy’s annual Thanksgiving Day Parade? The oversized Kermit balloon had already been in the parade since 1977, but now it was Miss Piggy’s turn – she appeared in the parade riding in a Hollywood star-appropriate Rolls Royce, while Jim and his family rode in the Electric Mayhem’s bus from The Muppet Movie. Jim loved a parade, and his characters participated in numerous ones over the years. The characters from Sesame Street never miss a Macy’s parade, either on a float or as giant balloons. 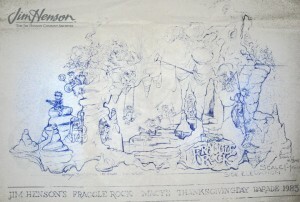 The Fraggles made their Macy’s parade debut with a float in 1983 and rolled along at the Gimbels parade in Philadelphia two years later. 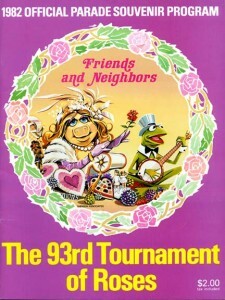 Numerous Rose Bowl parades have featured Muppets, with Kermit serving as Grand Marshall in 1996. But it is those giant balloons that capture the spirit of the Muppets so well, and in an exhibit at the New York Historical Society celebrating the 75th anniversary of Macy’s parade, Kermit’s giant inflated arm welcomed visitors and reminded them of the whimsy and delight experienced when you stand on the curb and watch a parade pass by. 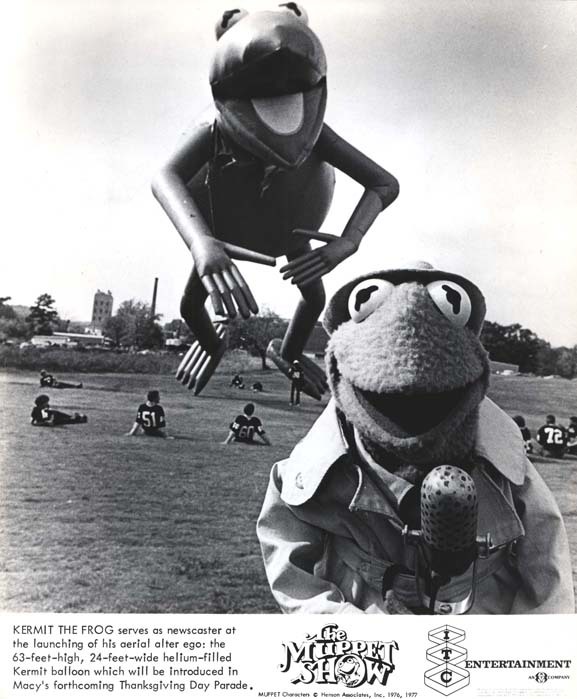 The Muppet Show promotional photo celebrating the launch of the Kermit the Frog balloon for the Macy’s Parade, 1977. 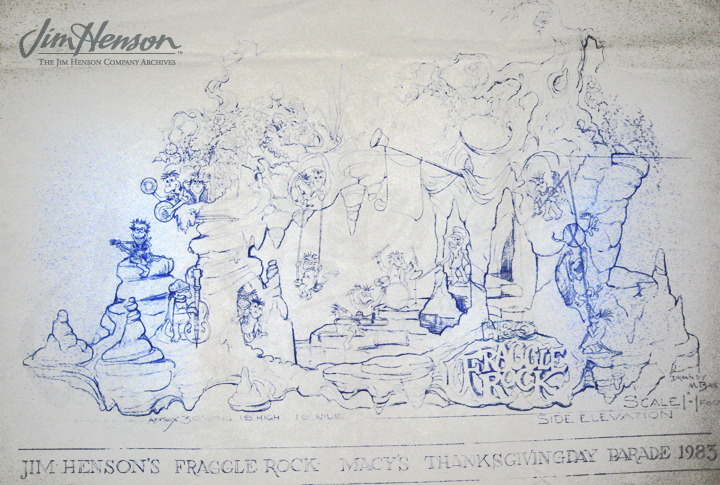 Michael Frith’s design for the Macy’s Parade Fraggle Rock float, 1983. Program for the 1982 Tournament of Roses Parade featuring a Muppets float. 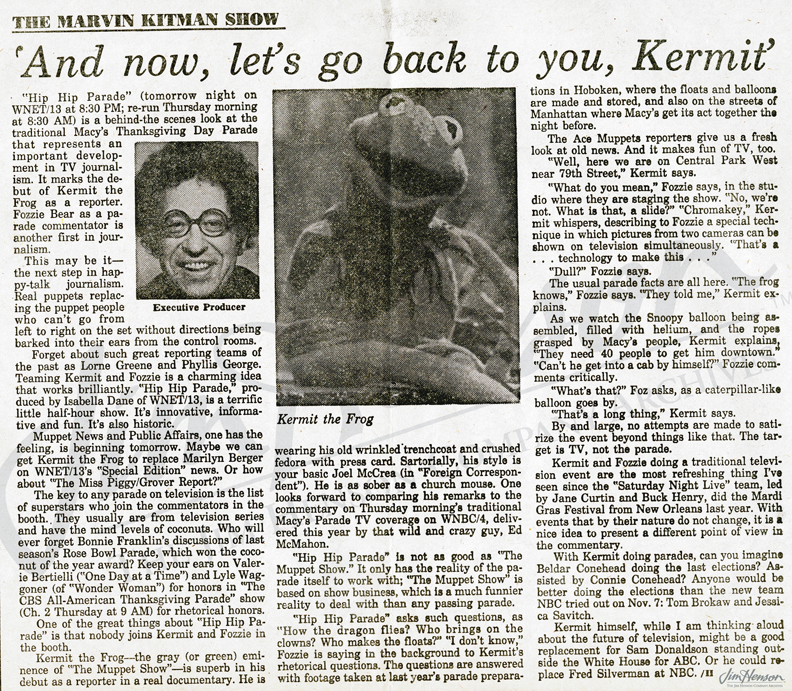 Review of Hip Hip Parade, a PBS special about the Macy’s Parade featuring Kermit the Frog and Fozzie Bear from Newsday, November 21, 1978. 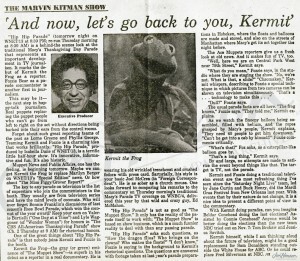 This entry was posted in 11-November '79, 1979, Appearances, Fraggle Rock, Muppet Movie, Muppet Show, Sesame Street and tagged Brian, Cheryl, Electric Mayhem, Kermit, Lisa, Macy's, Manhattan, Miss Piggy, parade, thanksgiving. Bookmark the permalink.